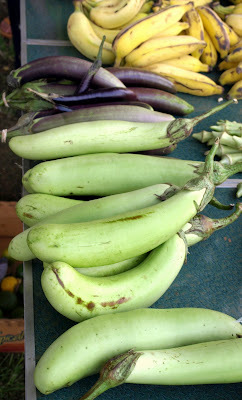 In the past two days, I've had the rare privilege of going to not just one, but two incredible farmers markets. The first, on Tuesday, was my beloved Ferry Building farmers market, in San Francisco. I've already written about this market before, so I'll just mention the salient points of my excursion: the summer produce (stone fruits, mostly) was simply incredible this time around. I've never loved plums, but the "flavor kings" and vast variety of pluots that I sampled at the market were the sweetest and most fragrant fruity morsels I've ever had. The white nectarines and peaches - quite floral in taste and aroma - were also divine. And then of course there were the gravensteins. I'd heard of this apple variety before, but hadn't ever tasted it; it reminded me of my favorite mcCouns and paula reds (tart and crisp New England varieties) that I devour for two straight weeks at the beginning of each autumn. I'll happily eat galas, fujis, and pink ladies during the spring and summer, but autumn apples, best eaten chilled or on the ride home after picking them up, are my favorite fruit. I purchased three lovely gravensteins and reveled in the anticipation of more delicious apples to come. Now, though, I'm far from any place with an acceptably chilly autumn; I'm writing this post from a breezy house in Kauai, Hawaii. We ventured to a farmers market here just this afternoon, which was a far cry (both in terms of offerings and overall feel) from the Ferry Building. 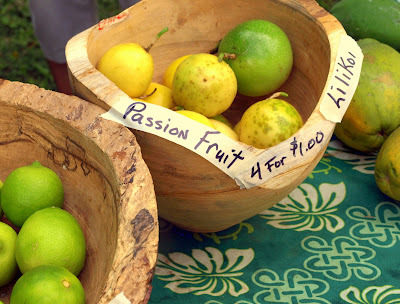 Nonetheless, it was quite the experience, and we walked away with, among other things, two purplish avocados, one miniature pineapple, four passion fruits (or lilikoi, as they are called here), one dragon fruit, a bunch of Chinese long beans, and several mangoes. I've never actually tried either a passion fruit or a dragon fruit, so I'm looking forward to those experiences. 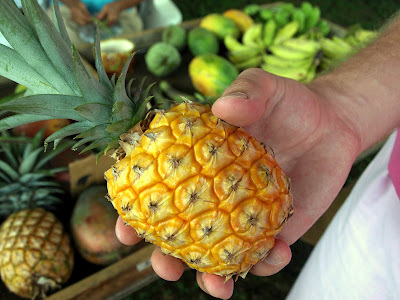 And I'm assuming the mini pineapple will taste like a regular pineapple (but it is SO much cuter), but can't yet say so for sure. As for our other Hawaiian food options, fish seems to be the food of the week; we enjoyed fish and shrimp tacos last night (homemade in our surprisingly well-equipped kitchen). Excited to be able to cook again, I also made a special dessert of homemade chocolate chip cookie ice cream sandwiches. The ice cream was vanilla Haagen Dazs, but the cookies were fresh from the oven. In the spirit of farmers markets, I've decided to share this simple (and adaptable) pasta recipe in keeping with my pattern of sharing some Red Ramekin kitchen dinner staples. I make this dish with whatever green vegetables and herbs I get at the farmers market, which lately has been broccoli, chard, and basil. Spinach, zucchini, or other firm vegetables would surely work, as well. If you are a tomato sauce kind of person, try adding a couple chopped tomatoes, or a can of diced San Marzanos to the sauce before adding the pasta. Bring large pot of salted water to boil and add pasta. Meanwhile, prepare sauce. Heat oil in a large skillet. Add garlic, shallot, and red pepper flakes and saute until softened slightly. Add tomato paste and cook for another few seconds, then add a hearty splash of white wine to the pan. After a few seconds, add broccoli and saute for a minute or so. Add a bit of pasta water if mixture is dry, then cover and let the broccoli soften a bit. Add chard. Season with salt and pepper and Italian herbs, if desired. Once pasta has cooked to al dente, drain quickly and add to skillet. Toss everything together, adding more pasta water and another drizzle of oil until desired consistency is achieved. Adjust for seasonings, then add fresh basil leaves and toss to combine. Serve immediately with a sprinkling of freshly grated parmesan. 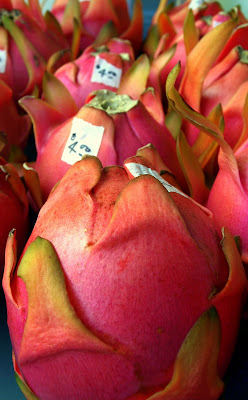 Dragon fruit was served at the end of every meal in VN and Cambodia. It is not my favorite, although it is beautiful and makes for a lovely fruit plate. I wonder if you can get rambutan or mangosteen? 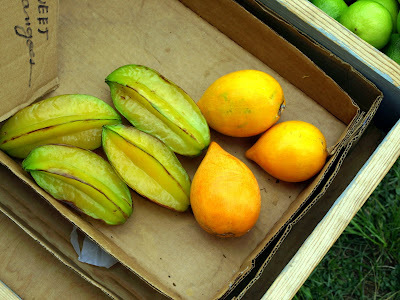 Those are two fruits worth searching for, especially the mangosteen.I have to tell you that I also bought some pluots at an exceptional little grocery store in Westford called 'Market Basket' and they were excellent! WOW! The joys of living in an exotic location, I suppose. 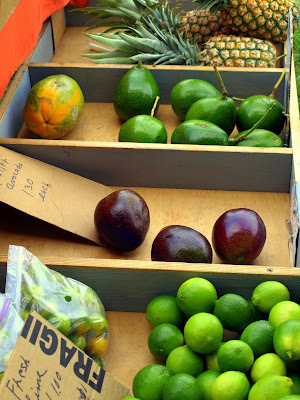 How awesome is shopping at a farmer's market in Hawaii! I adore farmer's markets and I want to cry it has been too long since I have been to one. Your photos alone have made going my number one priority for this coming weekend. Lovely!! !